“Amber Hewerdine knows more than she is telling. She knows that she hasn’t slept since the arson attack which killed her best friend. She knows that it is not normal for four members of your family to disappear one Christmas morning, and then reappear the next day, refusing to explain or ever speak of it again. And she knows that somewhere, buried deep in her subconscious, is the key to what happened all those years ago at Little Orchard. An insomniac, Amber is struggling against her own body, and consults a Hypnotherapist to she if they can help. Instead of the relief she needs, the session unlocks memories that Amber has unknowingly pushed from her consciousness. These confusing and still unplaced memories start Amber on a quest to discover where they come from and why the Police believe she holds the key to an unsolved murder case. As Amber tries to piece together a series of seemingly unconnected events, and consults the Hypnotherapist for further sessions, things become murkier rather than clearer, and the demons in her past threaten to overwhelm her. For me, Amber wasn’t a character I instantly liked, but the situation she found herself in, and how she reacted, made her highly intriguing. As the story progressed, and I found out more about Amber: how she’d taken in her best friends young children after her death, how she always felt in the shadow of her perfect sister-in-law, and how she decided to help DC Simon Waterhouse solve the case, she became someone I really wanted to root for. 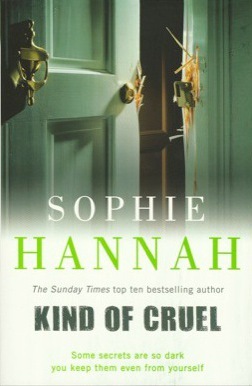 I’m a big fan of Sophie Hannah’s brand of complex psychological thrillers, and this story didn’t disappoint. It has a wealth of interwoven connections challenging the reader to solve them. Kind of Cruel is a chilling and unsettling tale of how unseen pressures and secrets within a family can distort and twist the everyday into the chilling. A shocking glimpse behind the mask of a seemingly ‘perfect’ family, and as much of a ‘why done it’ as a ‘who done it’. Looking for a little Paper Passion? I’m a huge Sophie Hannah fan, avidly read all of her books.